When I come to know that India won the toss and chose to bat,from that time I was in bit tension.Will Sachin made a mark today or he need another venue to complete to reach to milestone. I will consider Mohali people as luckiest people in India today. They saw Sachin who is in full flow and reached to highest point on cricket run chart. I feel very proud to be Indian first and then Marathi. Because Whenever I will go outside India especially UK, I can proudly say 'I am Indian'. I think such personalities are very rare on earth. I was really happy when he said at press conference that he is enjoying cricket and never thought of retiring at any stage. But I am really upset that 'DADA' is quitting from international cricket. I think Sourav Ganguli is the best batsman in one day's we ever had like Sachin.He reached to 10500 before 3 years and if he had consistentely played in 3 years for Indian team then now he also hold most run scorer in one day's. Bad luck to Price. But now its Sachin's day. I think if Sachin is playing 2011 world cup,then I am sure its ours this time.This is the only thing Sachin will miss in his life if he could not bring India a world cup. 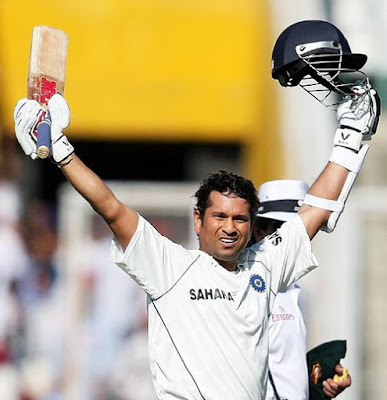 Good LUck Sachin! Go for it.